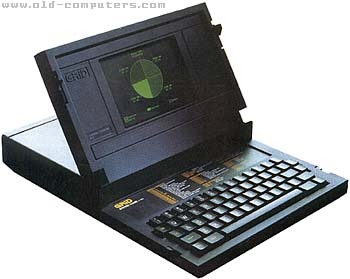 The Compass portable was the first computer of the Grid company; and the very first clamshell laptop (GRiD had the patent on the clamshell idea). It was an expensive portable business computer incorporating large memories (both RAM and data storage) for the time, but above all one of the first graphic amber plasma flat screen. It was housed in in a matt-black finished magnesium case. Not only does this gave increased protection (and weight) that some plastic shells, it also acted as a heat-sink, so there was no cooling fan. Stangely, there was no carrying handle either. Above the keyboard was a panel displaying common command codes to refresh user's memory. Instead of a disk drive, first Compass held a 384 KB non-volatile bubble memory (like the Sharp PC-5000). Software could be loaded from a Grid server, however, user could connect an external 360 KB floppy disc or 10 MB hard disk unit. The Compass also featured a built-in modem. In addition to being first in space, it was allso the first laptop used as operators positions aboard naval vessels, and it was the first laptop that was attached to paratroopers that were dropped behind enemy lines. The GRIDS were used to monitor troop and equipment movements and to send back tactical data to the command center. The heart of the operating system was "Compass Computer Operating System (CCOS). I employed the GRID in many research projects for which I was the project manager. One of these projects is the reason we now have GPS. Some of the programs I worked on used the std GRID and/or DOS software while others used software especially built for the project. Did anyone mention that you could daisychain multiple devices off the 488 I/O? This port was identified as the GPIB or Grid Processor Interface Bus. I Don't remember the limit, however, if I recall correctly, I remember having two 10 MB disk, one floppy disk, an HP plotter were daisychined off a single GRID 488 port. The Epson or Diablo printers ran off the serial port. Conceptionally, this mad the GRID more flexable then todays CPUs. If anyone were to ask, I would say that the GRID defined the term "User Friendly". I don't recall one occassion when a GRID crashed because of what an operator did. In addition to running on 110 VAC, the unit could be switched to 220 VAC. The only thing you needed to change was a switch and a fuse. GRID was way ahead of everyone else at that time. It is too bad they felt they could sit back on their lorals and do nothing. By the time they realized they needed to improve (make it lighter eg.) they were already playing catch-up; and never could. When Grid went out of business they sold their IP to Tandy, of Radio Shack and TRS-80 fame. Some time later Tandy lawyers noticed they had unknowingly purchased the patent on clamshell computers in the deal and notified all the other laptop makers that they would begin collecting royalties. After a legal battle the patent was upheld and a small portion of every single clamshell laptop sold by anybody went to Tandy. My understanding and recollection is that Grid never enforced their patent, so other makers went on producing clamshell designs for probably a decade before Tandy started making royalty noises. By then the clamshell design was firmly entrenched and it was a case of pay up or get out of the laptop business. see more Grid Compass Ebay auctions !